I've become quite conscious about sun damage in the past few years so most of the time I wear SPF, which means I don't tan much anymore. I now rely on gradual tanning products, 2-3 times a week, to give me a nice summer glow. I always shave the day before I apply the products, as I think it's too much aggravation for the skin to cope with at the same time. I've been using Gillette Venus (£7.49) and it's so much better than any other razor I've ever used. I know... how can I rave about a razor? It has gel bars that glide on smoothly and it never irritates my skin. No more cuts or that horrible burning feeling after shaving. The next day I start by scrubbing my body. It's essential to get rid of the dead skin, otherwise the product may look patchy and streaky. I've been loving Ren Moroccan Rose Otto Sugar Body Polish (£32). It's a fine sugar with rose extract. Smells lovely and leaves your skin feeling so hydrated, sometimes I don't even feel the need to moisturise afterwards. I apply just before jumping into the shower, when my skin is still dry. The texture is rough at first but the grains start to breakdown and turn into a smooth consistency. It's a very good way to stimulate the circulation. Such a luxurious product! Finally, I apply Palmer's Natural Bronze Gradual Tanning Moisturiser (£5.49). The chocolatey smell on this one does turn a little biscuity after a while, as most tanning products do, but I find it very mild. It doesn't bother me at all. Really good and affordable. 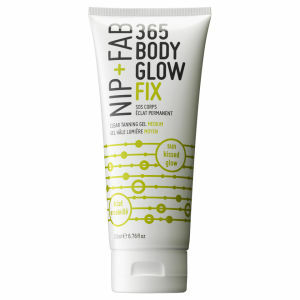 Recently, I also started using Nip + Fab Body Glow Fix (£9.95 at lookfantastic or a travel size with the Cosmopolitan Magazine that is out now for £3.70). This is a fast drying tanning gel that disappears on the skin almost immediately, without leaving any stickiness behind. It gives you a golden glow within 4 hours. It's easy to apply and can be used both on the face and body. It's got white tea to brighten the skin and Vitamin E to moisturise. The smell is very subtle. I have only been using this for a week now but I'm already in love! Even though August rain and strong winds are here to remind us that summer is nearly over in the UK, I think there's still some time left to enjoy short dresses and look our best. 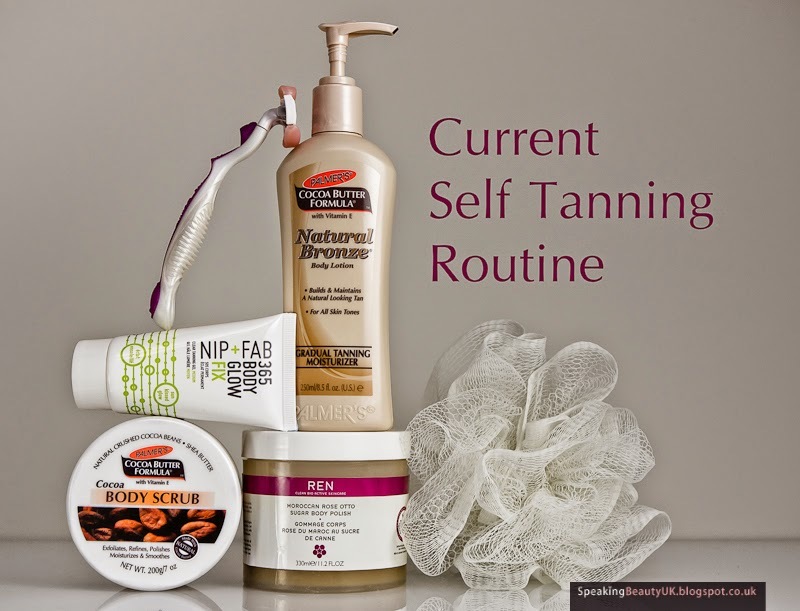 I love the Palmer's scrub and tan, I rarely apply false tan but when I do these two products really help get a natural look :) I'm also dying to try the nip and fab body glow but I can never seem to find it! I started playing around with gradual tans this year and started off with the Decleor Gradual Glow. Nice tan, but horrid smell which does tend to linger and is rather 'wet' - takes ages to dry. I'm now trying Utan by Ultimo (again, the gradual tan) and am very pleased with it. I have the body version and the face version. Also good for the face is Sisley gradual facial tan and equally good, the Clarins Radiance Plus Golden Glow Booster; you just add one to three drops to your moisturiser (according to the level of tan you want) and hey presto! On my list to try are Jergens, Sienna X and Vita Liberata. However, these are all pricey, unfortunately, so it's good to know there's an affordable drugstore brand that does the job. May I ask...how do you find 'staining'? Is there any? The Decleor has a tendency to yellow your bra straps. Utan not so much. Oh, dear, sorry, I seem to have rambled a bit! I love your blog and reviews. I love Palmers. Im a bit daunted by their tan though. Don't want to turn orange. I might venture out one day and I've always been tempted by their body scrub as I love their facial scrub.